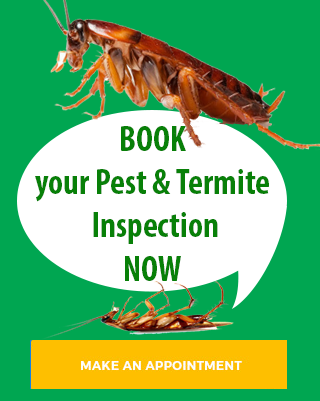 Evergreen Pest Control can eradicate all spider problems efficiently using the latest environmentally friendly pest control processes. We service all areas from the Gold Coast to Northern NSW including Burleigh Heads, Palm Beach, Elanora, Currumbin, Tullebudgera, Tugun, Bilinga, Kirra, Coolangatta, Tweed Heads, Banora Point, Terranora, Bilambil, Chinderah, Fingal Heads, Kingscliff, Cudgen, Salt, Pepper, Reef, Casuarina Beach, Duranbah, Tumbulgum, Condong, Eviron, Murwillumbah, Mooball, Burringbar, Uki, Bray Park, Clothiers Creek, Cabarita Beach / Bogangar, Hasting Point, Pottsville Beach, North & South Golden Beach, New Brighton, Ocean Shores, Brunswick Heads, Billinudgel, Mullumbimby, Byron Bay, Suffolk Park, Bangalow. The female measures up to 20mm in body length, with the slimmer male measuring about 12 mm. This species is dark plum to black, depending upon its age and recent moulting. Its legs may be reddish brown to black, depending on its age. The colouring and patterns darken with successive moults. Its carapace is glossy and pitted. At the adult stage, it has an outstanding patch of white on the dorsal tip of the abdomen. Juveniles have a double series of light patches on the dorsal surface of their abdomen, until they disappear altogether, leaving only the distinctive white tail in the adult. The White Tailed Spider preys on snare- making spiders. During the evening it positions itself at the outer edges of the web of the snare builder and plucks and strums the threads to imitate the struggling of an ensnared insect. The occupant makes an enthusiastic appearance and rushes forward, expecting to have captured an insect but, instead, it is violently seized upon by the White Tailed Spider. Its bite is believed to cause severe illness for a short duration. Although the portion of venom containing flesh-dissolving enzymes would fit on the head of a pin, necrotic sores sometimes follow the illness. The species carries the bacterium Mycobacterium ulcerans in its venom and it is this microscopic organism, which cause the infection, resulting in the spreading of ulcerous sores. This spider prefers cool places, where it often builds a temporary silken sack in the form of a tubular retreat, in which to shelter by day. In the bush in can be found beneath the flaking bark of the eucalypts. In late summer the spider matures and sometimes wanders into human habitation to escape the heat. 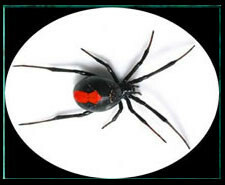 The dangerous red back spiders are notorious for their very poisonous venom. Red-Back spiders make a littery web and the webs can be described as an intersecting mass of scaffold work with a central area consisting of a three-dimensional trellis of silk from the web to the ground. The threads are vertical with sticky glue at the bottom. If an insect crawls against the thread it will break and the prey will hang in the air awaiting the attack of the spider. Although they are small of size they are violent attackers and do not fear to attack much larger insects than themselves. 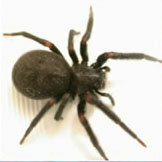 Red-back Spiders usually show no signs of aggression and, if threatened, curl up and fall to the ground. The majority of Red-back bites are caused by the spider being accidentally picked up and trapped against the palm of the hand when cleaning out rubbish from a workshop or the garden. The venom of this species has proved fatal, so the spider needs to be treated with due caution. Only the female is dangerous to humans. The fangs of the male are too small to penetrate skin. Even though only a tiny amount of venom is injected, a bite can cause serious illness, as the poison attacks the nervous system. Medical attention should be sought as soon as possible. The Garden Orb Weavers build large, strong, vertical orb webs. Generally, the spider constructs its web in the evenings and takes it down again at dawn. The spider rests head-down in the center of the web, waiting for prey. 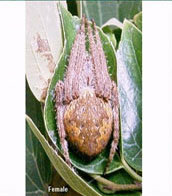 During the day, the spider rests on nearby foliage with its legs drawn under the body. 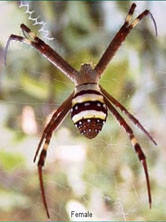 Birds such as honeyeaters are common predators of these spiders. Flying insects such as flies, beetles and bugs (including large prey like cicadas), are common prey. Butterflies and day-active moths are sometimes caught but are partially protected from web entrapment by the presence of scales on their wings – these scales can be shed and this may allow the insect to struggle free of the sticky web. 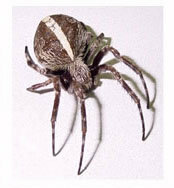 The commonly seen Garden Orb Weavers is 2 – 3 cm (female) or 1.5 – 2 cm (male) in body length. Most are stout, reddish-brown or grey spiders with a leaf-shaped pattern on their fat, roughly triangular abdomens, which also have two noticeable humps towards the front. They sometimes have a dorsal stripe, which may be white, or brown edged with white. The female Garden Orb Weaver lays her eggs in late summer to autumn. The eggs are encased in a fluffy silken cocoon and attached to foliage. The lifespan is about twelve months. They mature in summer, mate, lay their eggs, and die in late summer-autumn. Males and females are similar in size. During autumn, the spiderlings disperse by ballooning (floating on the breeze using small silk strands as “balloons”), and build their own tiny orb webs among vegetation. In the Golden Orb Weaver group, it is common for a number of tiny (6 mm) males to live around the edges of a female’s web, waiting for a mating opportunity. After mating, the female Golden Orb Weaver wraps her single egg sac in a mass of golden silk, which is then hidden on foliage away from the web, disguised within a curled leaf or sprig of twigs. Predators of orb weavers include several bird species and wasps of the family Sphecidae. The wasps land on the web, lure the spider to the perimeter by imitating a struggling insect’s vibrations, and then carry the spider away to be paralysed and stored as live food for their young. Orb weavers are reluctant to bite. Symptoms are usually negligible or mild local pain, numbness and swelling. Occasionally nausea and dizziness can occur after a bite. The Sydney Funnel-web Spider is believed to be limited to an area of about 160 kilometres from the centre of Sydney. Other species of Funnel-Web Spider are found in Eastern Australia, Victoria, South Australia and Tasmania. They are probably the most venomous aggressive spiders in the world; all funnel web species are lethal to humans, not just the Sydney or Northern tree dweller. If they bite you it is usually a pretty deep injection but even a small grazing bite means get to hospital immediately. The Sydney Funnel-web constructs its own burrow, which may be over a foot deep or uses a suitable crevice in rocks or around house foundations. Sometimes, Funnel-webs may be found in colonies of over a hundred. The webs are white and often tubular rather than funnel-like with supporting lines running out to surrounding rocks and debris. 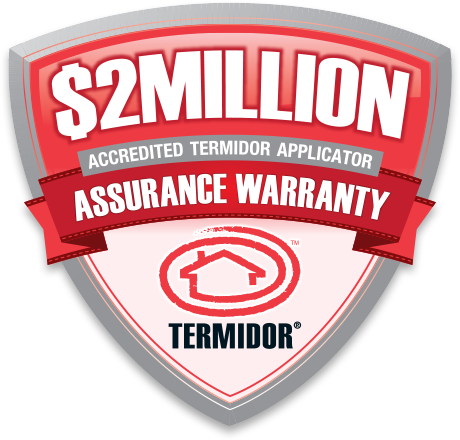 The spiders may take several years to reach maturity and live for perhaps 8 years or longer. When mature, the males leave their webs and lead a homeless existence. They tend to roam and often enter homes particularly during summer after a heavy downpour of rain. They mate with a female for only one season and if not killed shortly after mating, die within a few months. This spider is one of Australia’s largest and most easily identified. The body of a female Sydney Funnel-web spider measures about 35mm in length and the male about 25mm. 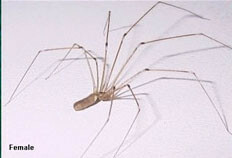 The paired spinnerets at the end of the abdomen are particularly long, much longer than those of other large dark spiders. The male is of a more delicate build than the female and has 2 features, which help identification. One is a little spur half way along its second leg on each side and the other is finely pointed feelers to transfer sperm to the female. Both sexes are very aggressive and when approached, will rear up into a ready-to-strike position. Their massive fangs can penetrate a child’s fingernail. However, most people bitten by them are not injected with sufficient venom to cause any illness. Often it falls off the tips of the spider’s fangs as it makes a preliminary downward thrust. People bitten by the female may at the most suffer pain around the bitten area. The venom of the male is 5 times more toxic than the female. Man and monkeys seem to be especially susceptible to the venom. For example, rabbits can be given very large doses of the venom with no apparent effect but a small dose injected into a monkey produces the terrifying symptoms seen in humans. When a victim has died, and in which the spider has been positively identified, it has been a male spider. The venom contains a low molecular weight toxin called atraxtoxin, which attacks the nerves of the body causing thousands of electrical impulses to be fired down them. The muscles twitch and there is a profuse flow of perspiration, tears and saliva. The venom also causes changes to blood vessels, which can lead to shock and coma due to brain damage. All the evidence suggests that the effects wear off after a few hours. Provided the victim reaches hospital before serious illness has developed, he or she has an excellent chance of recovery. An anti-venom to the venom of the Sydney Funnel-web Spider became available in 1980. The Northern or Tree-dwelling Funnel-web Spider is the most dangerous member of this species and near to the most dangerous in the world. They are found from northern New South Wales to southern Queensland, usually in heavily timbered areas, which are rarely entered by man. A female may make her nest in a hole as high as 18 metres from the base of a tree. The venom from both males and females has shown to be more toxic than the male Sydney Funnel-web. The anti-venom developed for the Sydney Funnel-web may be used effectively against the Northern Funnel-web. The Wolf Spider got its name because it stalks its prey like a wild dog. It is an open range hunting spider. The female grows to 35mm and the male to 20mm. They are a small to medium size spider. They can be grey or brown with marking on their back which can be black, orange, grey or brown. 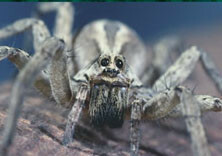 The Wolf Spider has three rows of eyes, two at the back, two in the centre and four in the front. 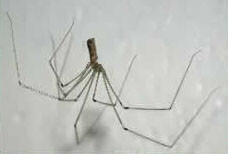 They are a long-legged, hairy spider. The Wolf Spider lives all over Australia. They live near water, open woodlands, grasslands, gardens and forests. They dig burrows 25cm deep with their jaws where they live. They like the clay and sand mix best, then they build a silk fence mixed with leaves to keep the water out. Some of the species have a lid on their burrows. The Wolf Spiders eat crickets, locusts, other spiders, ants, grasshoppers, frogs, lizards, mice and tiny birds. The spider leaves its home at dusk, looking for food. The Wolf Spiders rely on good eyesight, speed and strength in stalking prey. The Wolf Spider can overpower a large cricket this way. The spider cannot eat meat, they can only drink the liquid out of the prey. They use a sucking motion like drinking liquid through a straw. Wolf spiders’ main enemy is man and the spider-hunting wasp which attacks and devours the wolf spider. The Wolf Spider is not an aggressive spider. If the spider is handled, it can cause a painful bite which may cause infection and skin lesions to some people. No human has died from the bite of the Wolf Spider but a fully grown Labrador can die in a few hours after being bitten by a Wolf Spider. When bitten, the venom enters the body. The Wolf Spiders fangs are needle-like apparatus which administer venom. They point downward from their bodies. The male and female of the species generally have the same venom toxicity, or at least no studies have been done to prove otherwise. There is no special first aid required after a bite, but see your doctor if bitten. Commonly found around buildings in the corners of window frames and doors, in crevices of brickwork, under eaves, etc. In nature, they are found in holes in tree trunks, crevices in rocks, etc. The distinctive lacy web with funnels is sometimes confused with that of a funnel-web spider, but all species of funnel-web spiders found in Victoria build their retreats at or below ground level. The black house spider is a timid spider and will normally only venture from its retreat when prey is entangled in the web. The prey is then quickly seized and dragged back into the tube. Males wander at night during the mating period. After mating the female lays her silk-encased eggs within the tube. The maximum life span is around two years. Male: Similar to female but often slightly paler. Female: Cephalothorax and legs shiny black, abdomen duller black or grey-black. Lacy sheet with one or two funnel-shaped entrances leading into a tubular retreat. 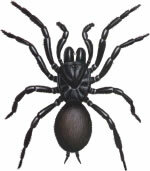 The venom of the Black House Spider is poisonous but not lethal, it can cause harm to humans. Bites are rare and usually occur when people attempt to move the web. The Black House Spider is not usually aggressive but will bite if they are annoyed. The bite may cause vomiting, nausea, heavy sweating, breathing problems, muscular pain, however their symptoms are only temporary. It has also been associated with at least one case of skin ulceration and necrosis. 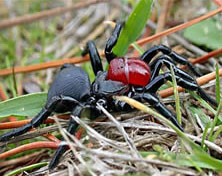 Bites are not frequently reported, possibly due to the relatively nondescript all black appearance of this spider (as compared with the redback spider or the white tailed spider, for example). Superficially, Trapdoor spiders resemble Funnel-Web Spiders. However, the majority of Trapdoor spiders are brown in colour, often having mottled patterns of leaf-like bands on the dorsal surface of the abdomen, whereas Funnel-web spiders are generally black and without markings. In arid areas trapdoor spiders often build burrows under a tree to snare insects attracted to the tree’s moisture. Trapdoor Spiders can move up to 140 times their own weight. The hunting methods of Trapdoor spiders vary according to habitat. Species living in moist places with plenty of insects can rely on the ambush. At night the spider lurks at the entrance to its burrow. It puts out its front two pairs of legs, which have hairs that are sensitive to ground vibrations. When a victim passes by, the spider lunges forward and strikes. The spider strikes so quickly that it occasionally drags inedible prey into its burrow by mistake. 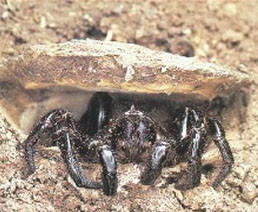 Mature male Trapdoor spiders wander during humid weather in search of a mate. Mating takes place within the female’s burrow. The male usually escapes being eaten in order to mate with several females, before dying. The female will lay her eggs several months after mating, and protects them within her burrow. When the juveniles have hatched, they remain for several months before dispersing on the ground. They will then make their own miniature burrows. Each time the spider grows bigger, it has to widen its burrow and, in the door-building species, add another rim to the door. In undamaged trapdoors, annual concentric rings can be seen. When threatened, this spider may show aggression or a mocking gesture of bravado but more than likely it will attempt to run away. The species is not known to be dangerous to man. Trapdoor Spider bites may cause local pain and swelling. Seek medical attention if symptoms persist. Collect spider for a positive identification. spiders get their name for the way their hold their eight legs in pairs to form an X shape. The X is called the St. Andrew’s cross because it is believed that the saint was martyred on a cross of this shape rather than the conventional + shape. Besides their standard orb-web, Argiope spiders build additional white opaque zig zag lines on their webs, called stabilimentum. Sometimes the zig-zag lines match their leg positions, which lead some people to suggest that this helps give the appearance of longer legs. Some spiders build a single vertical line, yet others a patch of zig zags in the centre of the web. No matter the design, the spider sits right smack in the middle. The bite of this spider is considered harmless or at most to cause a weak local reaction. Few bites have been recorded. LOW RISK TO HUMANS – environmentally beneficial –The bite of the St Andrews Cross is of low risk to humans. They are a non-aggressive group of spiders. There are no reported instances of any serious consequences of human contact with these spiders … excepting the fright of walking into their large web and the spider crawling over the person involved. Area of distribution. Found across Australia, including Tasmania. Size. The size of an adult is about 15 mm in body length. Habitat. This spider is a web-weaver usually found in summer in garden areas around the home. This spider is considered beneficial as it spins a large web to snare flying insects, such as flies and mosquitoes. The cosmopolitan Daddy Long-legs Spider belongs to a group known as the tangle-web spiders, of which there are 12 Australian species. It builds irregular webs in sheltered areas, often in and around human habitation including houses, garages and sheds. It feeds on insects and other spiders. Its successful use of human-made structures has made it one of the most common spiders in Australia. There is a persistent belief that the Daddy Long-legs Spider has the most toxic venom of all spiders.However, there is no scientific evidence to back this up. Its tiny fangs are incapable of piercing human skin. The myth probably grew from observations that the Daddy Long-legs Spider will kill and eat a Redback Spider. The Mouse Spider is a member of the Trapdoor family. 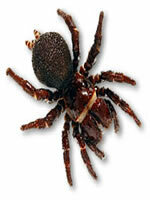 There are two types of Mouse Spider – the Red Headed Mouse Spider and the Eastern Mouse Spider. At full size, the Mouse Spider is about the size of a 50c piece or 1 to 3 centimetres. They have short stocky legs with tiny eyes spread across the head. The male Red Headed Mouse spider has a bright red head and a blue abdomen. The Mouse Spider lives all over Australia but not in Tasmania. It lives in arid conditions as well as rainforests and bush lands. The home of the Mouse Spider is a burrow, oval shaped, of moderate depth and straight down. A female spider spends all their lives in the burrow. Male spiders wander in spring to autumn. The burrow may be plastered with mud and digestive juices then lined with silk. Insects are the main prey of Mouse Spiders but many take whatever they can overpower like frogs, lizards, mice and sometimes-small birds and other spiders. The prey is grasped and crushed. It is further immobilised with venom. The Mouse Spider cannot digest anything solid. It regurgitates some stomach contents over the prey to liquefy internal organs. Then it draws juices out of its victim and into the spider’s main gut. Mating and Reproduction. In the mating season, the male spider leaves the burrow to search for a female. When he finds a female spiders, he may be allowed to enter the burrow where mating occurs. He will bend his pedipalps under her body to deposit sperm. If he is lucky, he may survive. In the wild, no male spider survives more than one breeding season. The eggs of the spider are laid in smaller numbers in a side chamber halfway down the burrow. This is the egg sac. Chances of survival are greater because they receive the further protection of the mother’s lair. Once hatched, the spiderlings may stay there for months, sharing her food. Toxicity. 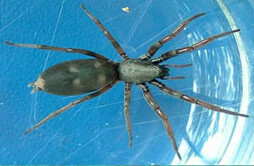 The aggressive female Mouse Spider is potentially dangerous to humans and animals. The male spider venom output may be low. The fangs are large, long and high in venom. They may have very toxic venom but bites are uncommon. As the toxicity of their bite is not fully understood, First Aid, if bitten, should be as for a Funnel Web bite – immobilise the limb, apply a pressure bandage then take the victim to hospital for the antivenom of the Funnel Web spider. The Mouse Spider takes several years to mature. A female may live up to 10 years. Predators of the Mouse Spider are wasps, bandicoots, scorpions and centipedes. These spiders are commonly known as Tarantulas. Huntsman generally have a some-what flattened body, which helps them to enter cracks and crevices in rocks and under bark. A large Huntsman Spider may measure 160 mm, the males are always smaller than the females and are easily recognised by their club shaped palps, which are very bulbous. Certain Huntsman- for example, two species of Neosparassus- are considered dangerous to humans. However, the majority are entirely harmless. If you get a bite from a huntsman, it will be painful and swelling may occur. A cold pack can be applied to help relieve the symptoms, but if pain persists please see a doctor.